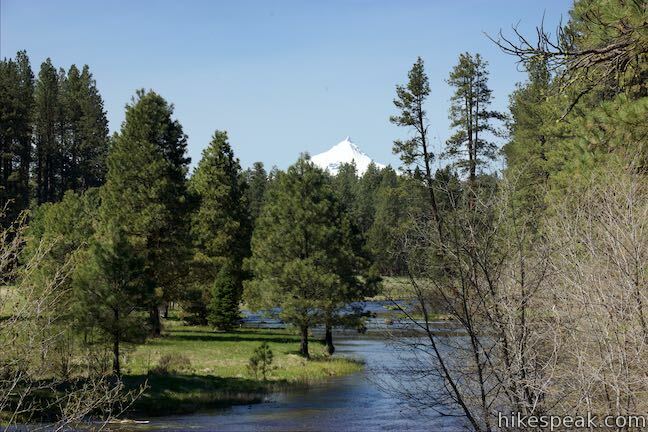 Gaze north from the observation site at the end of Head of the Metolius Trail and you’ll have a beautiful (if traditional) view of a river flowing through a pine forest toward Mount Jefferson. Look in the other direction to see something surprising. The river springs to live all at once from a gushing source. 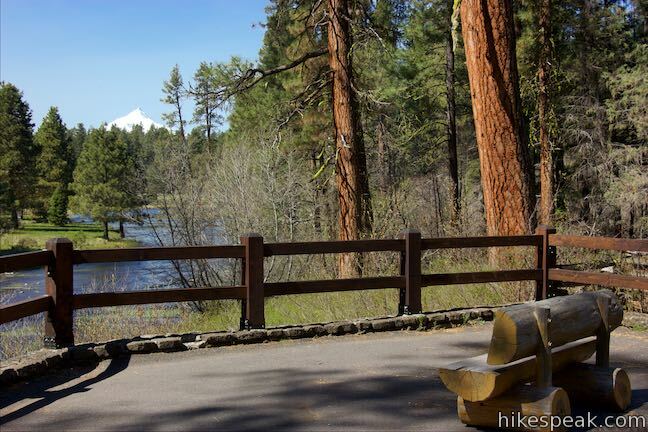 The trail to Head of the Metolius in Deschutes National Forest is a quarter mile long and paved. 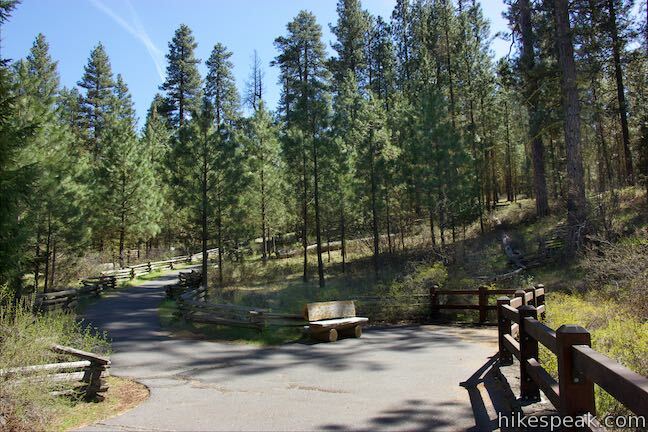 The hike begins next to Black Butte, north of the town of Sisters in Central Oregon. 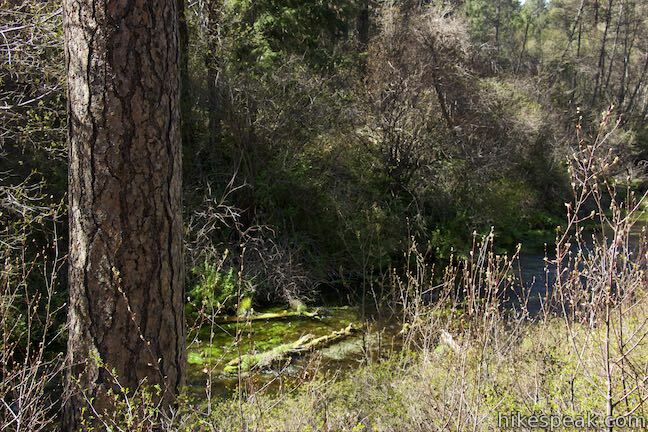 Down this path a full sized river, the Metolius, flows ice cold from huge springs. 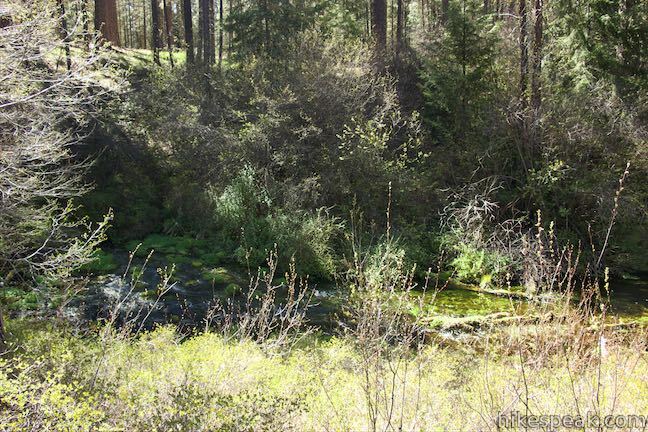 The springs appear to originate beneath Black Butte. However, geologists say this is misleading and believe the springs have their origin in the Cascade Mountains to the west. 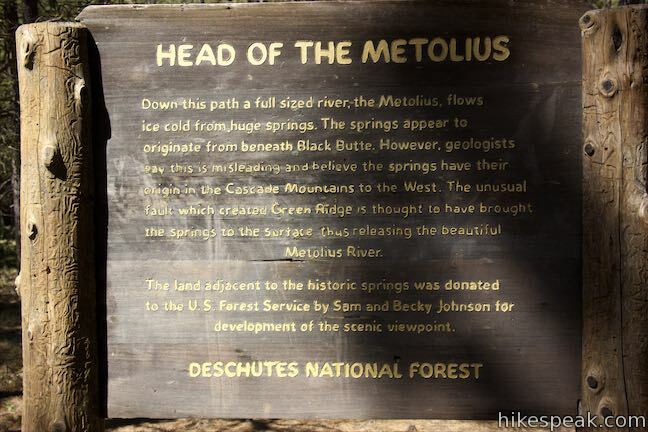 The unusual fault that created Green Ridge is thought to have brought the springs to the surface, thus releasing the beautiful Metolius River. 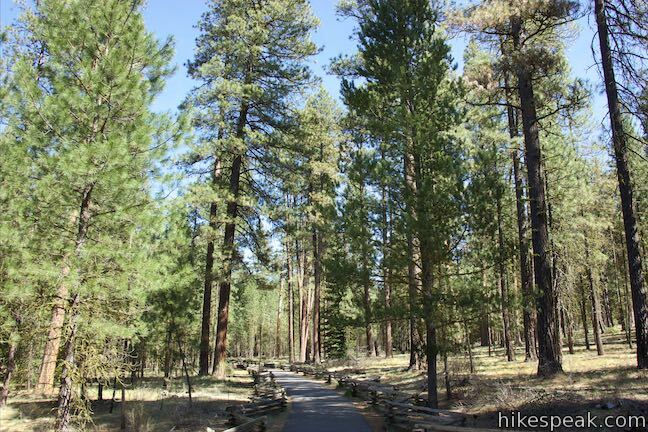 Set out down the paved trail through a forest of ponderosa pines. 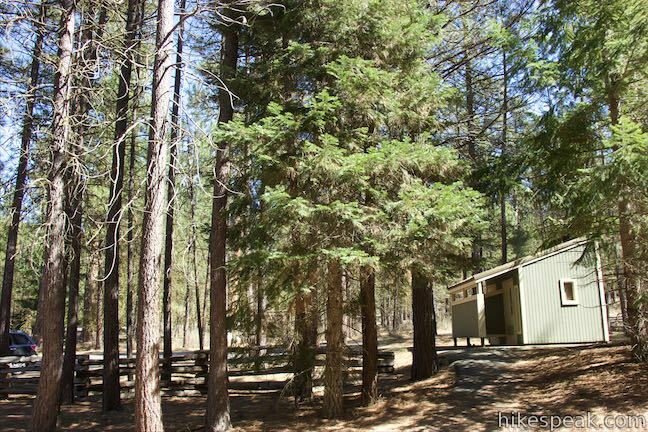 Enjoy the fragrant pines as you make your way along the easy trail. Eventually, the paved path curves to the right and descends to a viewpoint. Step up to the railing at the overlook and take in two wonders. 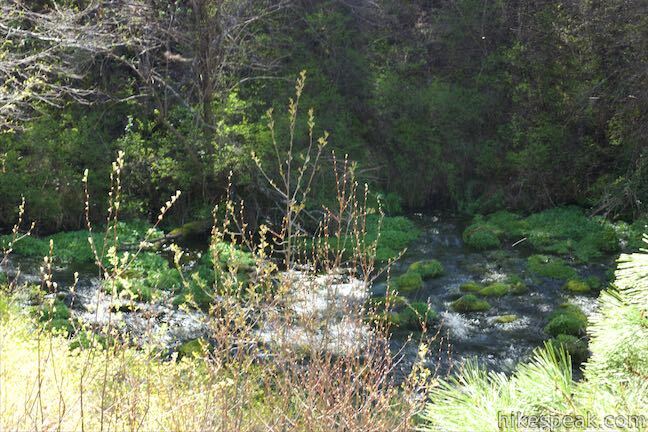 To your left, you’ll see and hear water gushing out of Metolius Springs. The water, which seems to come from nowhere, flows at a rate of 50,000 gallons per minute. Turn to the right and you can watch the freshly minted river flow north through the forest. If you only looked in this direction, you would never imagine the river’s source was so close. Looking north up the river, you should see the snow-capped summit of Oregon’s second tallest mountain, Mount Jefferson, which rises to a point nearly 10,500 feet tall. Benches are provided at the end of the trail so that you can relax and take in the setting before walking back. 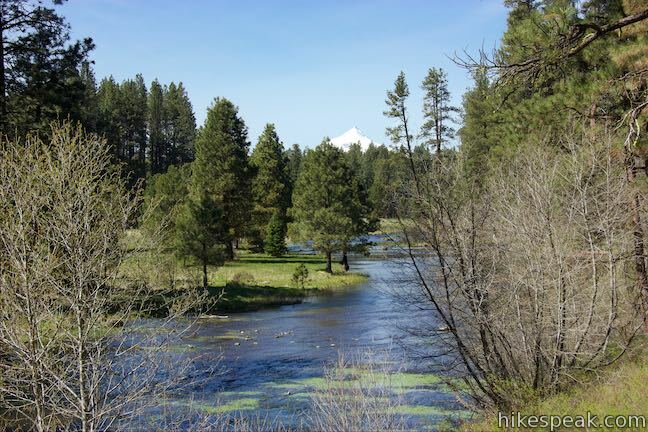 Head of the Metolius Trail is 0.5 miles round trip with 35 feet of elevation change. Dogs and bikes are welcome. 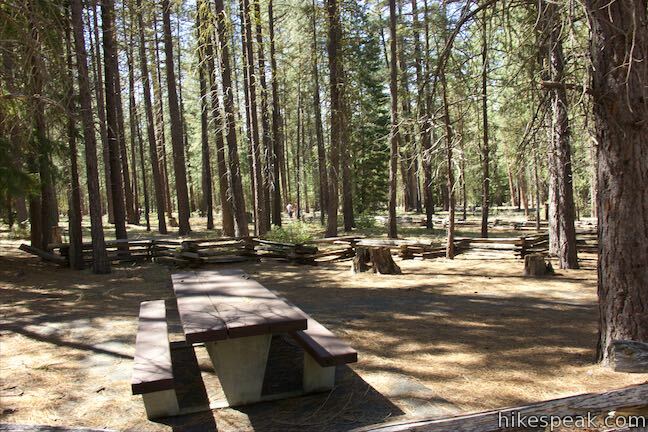 Picnic tables and toilets are located at the trailhead. 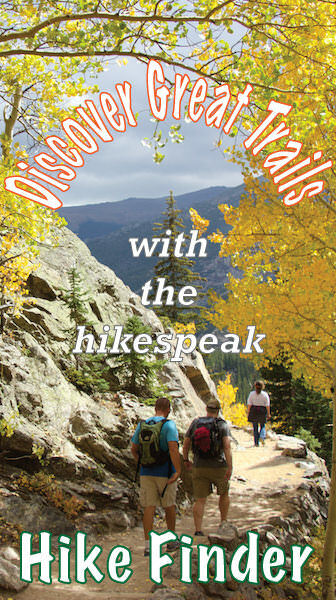 No fee is required to park at the trailhead and a permit is not necessary for this short hike, so get out and enjoy! 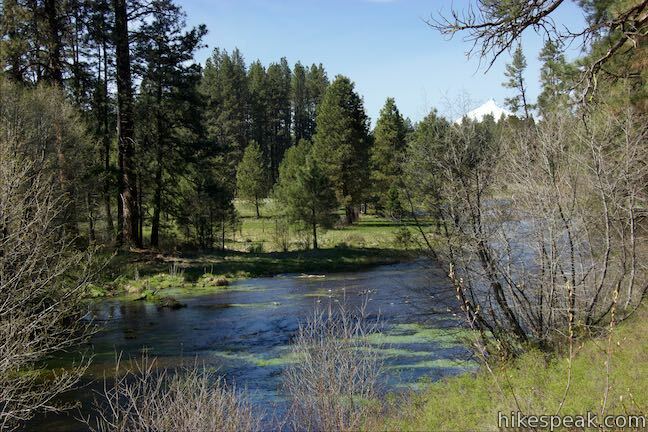 The nearby hamlet of Camp Sherman, a little farther down Metolius River, is also interesting to visit. 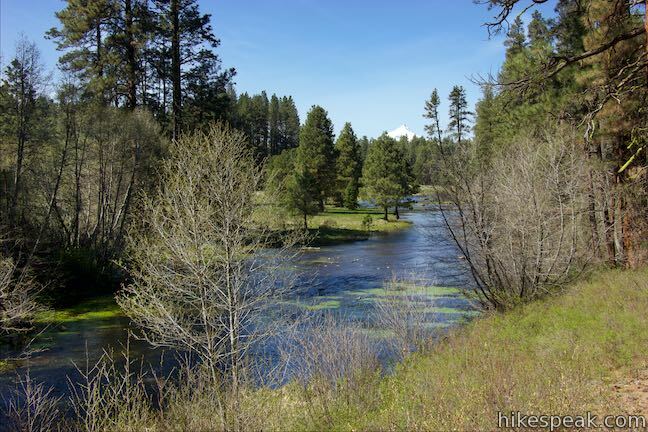 To see another impressive springs on Metolius River, check out nearby West Metolius River Trail. To get to the trailhead: From Sisters, drive northeast on Route 20 for 9.5 miles to Camp Sherman Road. Turn right and take this road along the base of Black Butte. 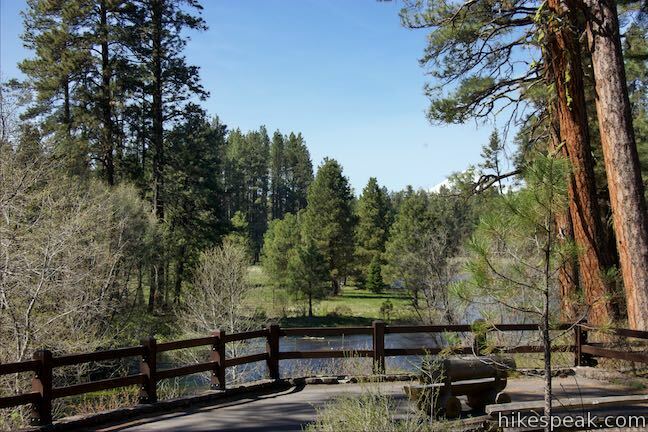 Drive 2.7 miles to a split and bear right onto Metolius River Road (National Forest Development Road 14). Go another 1.6 miles and turn left into the parking area for the trail. 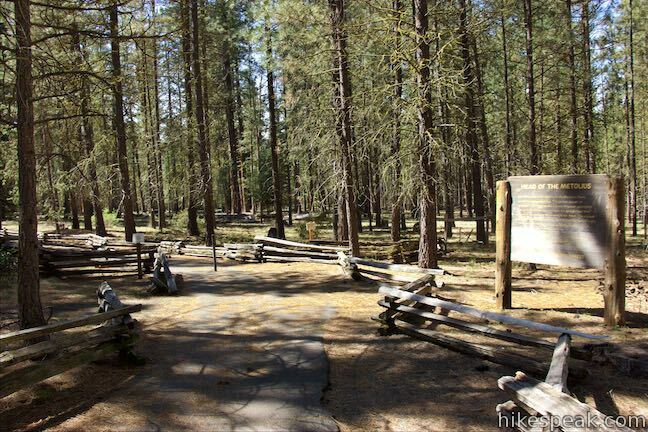 You may also view a regional map of surrounding Oregon trails and campgrounds. These photos were taken in April of 2016. Click to enlarge. 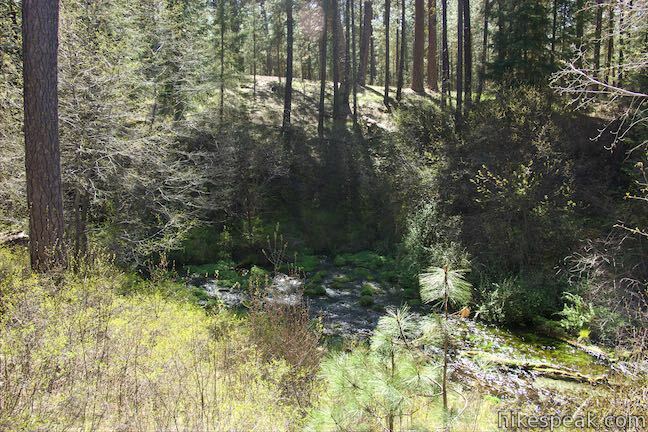 The 5.4-mile hike follows the west bank of the Metolius River to incredible gushing springs and a fish hatchery. The 4-mile hike summits one of the most identifiable peaks in Central Oregon, which has fire lookout towers and panoramic views of the Cascade Mountains. This charming 5-mile curcuit crosses lava fields and old-growth forests along the shore of a strikingly clear Cascadian lake. 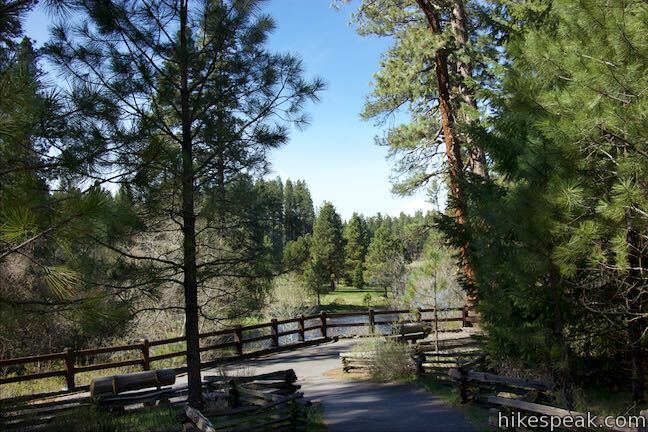 This 1.25-mile hike descends a ravine to clifftop views over a dramatic canyon on the Deschutes River. 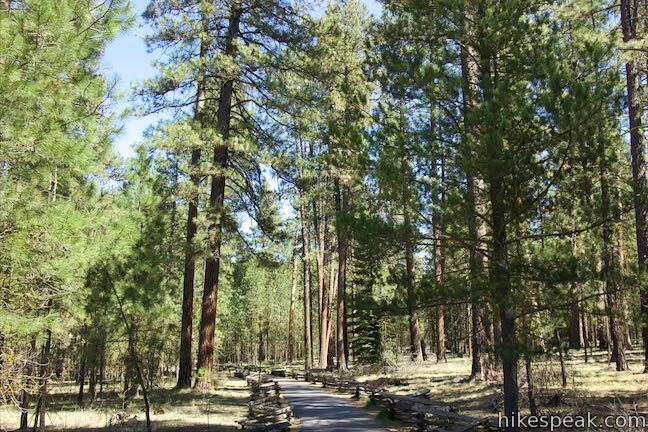 This 4.75-mile tour of Shevlin Park just a few miles east of Bend explores pine forests on both sides of Tumalo Creek. 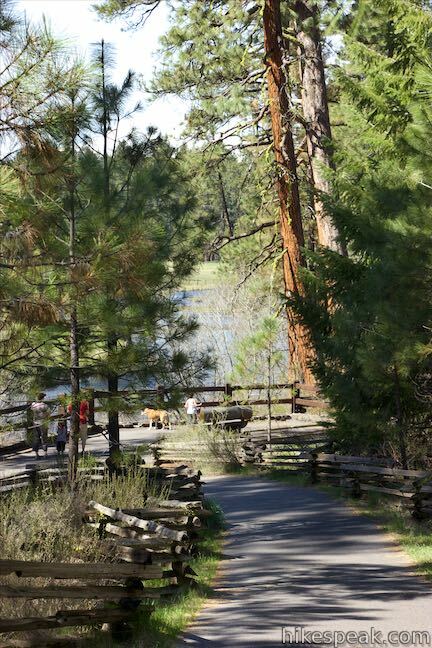 This 1.8-mile hike ventures up the dominant landmark in Bend to offer sweeping views of the majestic surroundings. This 0.9-mile hike leads to a natural hot springs in Willamette National Forest where bathers can soak in a series of terraced pools. This 5.2-mile hike crosses a fern-covered forest to reach the crown of Spencer Butte where there are panoramic views to enjoy. 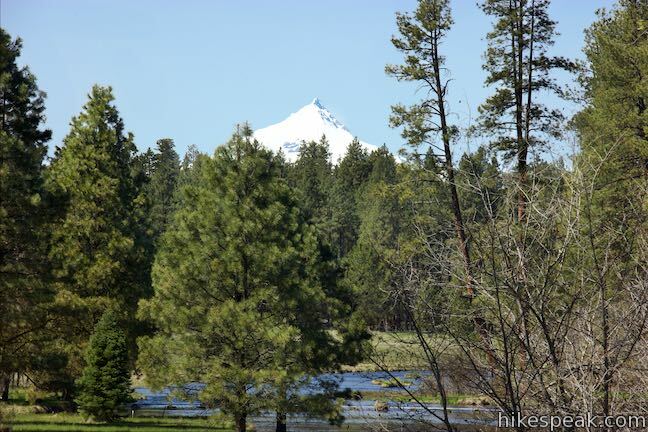 Explore other hikes in Oregon outside the Bend area. 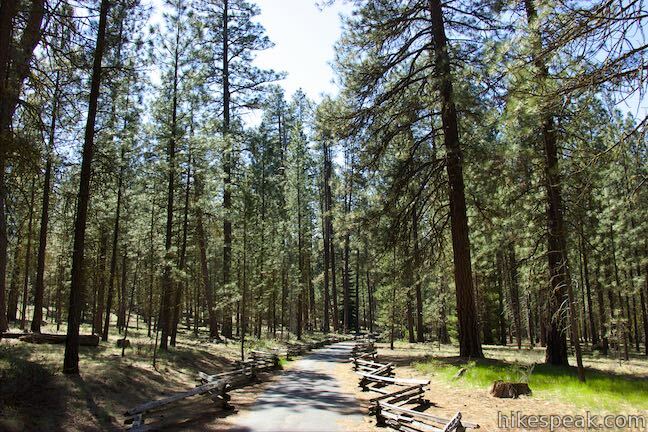 This spacious 7-site campground is sparsely shaded by pines next to the confluence of Canyon Creek and Metolius River.